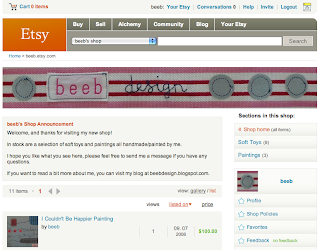 It's been nearly a year since I signed up for a shop on online emporium Etsy. Well, I've finally got my act together and stocked my shop, with eight of my beeb toys, and three in a new series of paintings that I've been working on. This is a very exciting day! Now I just need to get the word out to get some some people through the virtual door of aforementioned shop, and fingers crossed make some sales.... watch this space!! I've also just added a link on the side of the blog that shows thumbnails of the items in my shop, and takes you straight there.